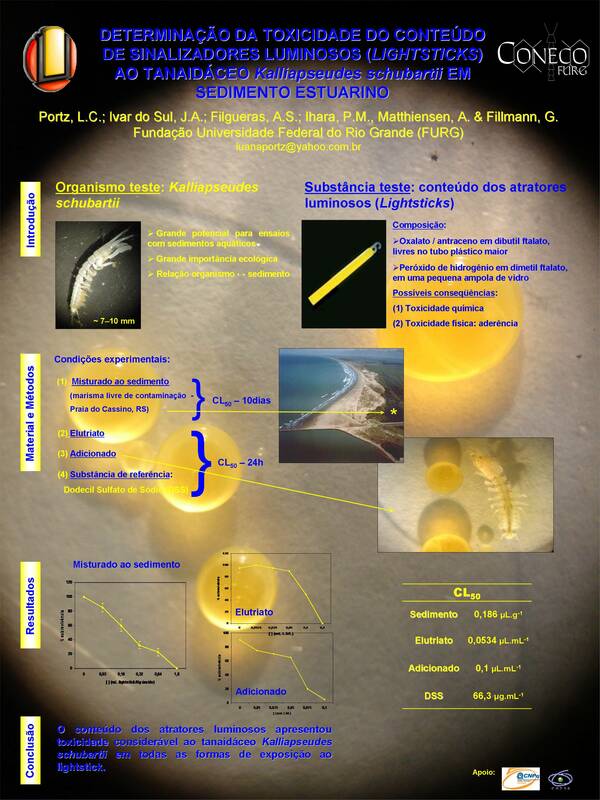 Does light-stick content pose any threat to marine organisms? Congresso Brasileiro de Ecotoxicologia (Ecotox), realizado em São Pedro, São Paulo, Brasil, del 03 a 06 de Julho de 2006. 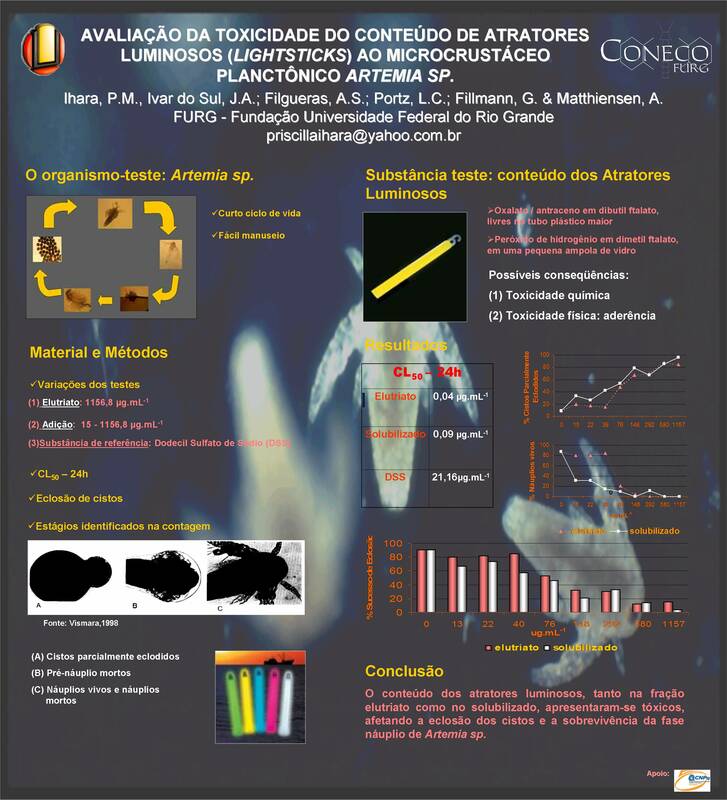 AVALIAÇÃO DA TOXICIDADE DO CONTEÚDO DE ATRATORES LUMINOSOS (LIGHTSTICKS) AO MICROCRUSTÁCEO PLANCTÔNICO ARTEMIA SP. VII Congresso SETAC-LA, realizado em Santiago, Chile, de 16 a 19 de Outubro de 2005. This here I find on the beach, take it home, then I get here and if there is no gas I cut it open, pour it on the fire and light a match. That is a strange big fire. If there is no gas for the gas lamp, I go back to the beach, get a good amount of these, because you need more than 500 to fill up the gas lamp, so I cut them with the knife, fill up the gas lamp, and with this trunk here, I light up my place until the next morning. Isto aqui eu acho na praia, trago pra casa, chego aqui, quando eu não tenho gás, aí eu corto ele de facão, meto no fogo e risco o fósforo, é um fogão esquisito. Quando não tem gás pro candeeiro, eu vou na praia outra vez, arranjo um bocado, que é mais de 500 pra dá um candeeiro de gás, e aí sento o facão, encho o candeeiro, e me alumio até de manhã, com este troço aqui. Das hier finde ich am Strand, bringe es nach Hause, komme hier an, und wenn kein Gas da ist, dann schneide ich das mit dem Messer auf, schütte es auf die Feuerstelle und zünde ein Streichholz an. Das gibt ein merkwürdiges, großes Feuer. Wenn kein Gas für die Gaslampe da ist, gehe ich nochmal an den Strand, treibe eine schöne Menge auf, denn man braucht mehr als 500 für eine Gaslampe, und dann gehe ich mit dem Messer ran, fülle die Gaslampe und beleuchte mich bis zum Morgen mit diesem Stab hier. Read some of the statements that we have received as emails sent by people from different states in Brazil (including one from Uruguay) regarding lightsticks on beaches. Have you found any lightsticks on the beach already? Leia alguns depoimentos que nós recebemos pelo e-mail, de pessoas de diferentes estados do Brasil (inlcusive um do Uruguai), citando a ocorrência dos lightsticks na praia. Você já encontrou lightstick na praia? 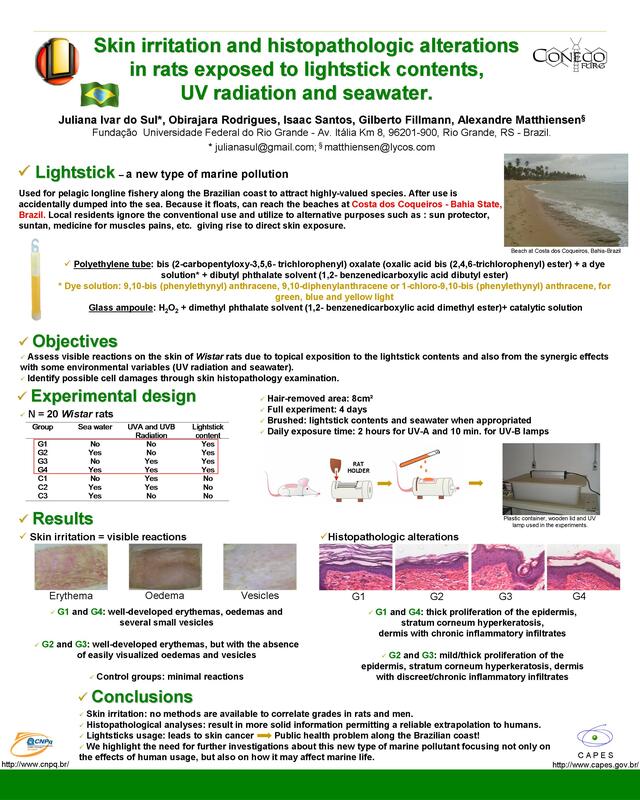 Hello, once I had seen a poster about the lightsticks in Baixios, I started to pay more attention to the beaches, the litter on the beaches along the North Coast of Bahia. And then I found some lightsticks at Praia do Forte. I would like to inform you that I always find them on the same beach. I have kept the lightsticks her with me and I would like to hand them over to you, how can I do this? Olá, Encontrando um cartaz de divulgação sobre os sinalizadores em Baixios, comecei a prestar mais atenção às praias, ao lixo nas praias do litoral norte da bahia. Foi ai que encontrei alguns sinalizadores na Praia do Forte. Gostaria de frizar que sempre venho encontrando na mesma praia. Os sinalizadores estão guardados aqui comigo, e eu gostari de estar entregando a vocês, como posso estar fazendo isso? First of all, congratulations on your work. The initiative should be multiplied. Since 1991, I hike trails on the coast of Maranhão and I have been pointing out to the pollution of these trails by marine litter, in particular the litter that is dumped by ships mooring in the port of São Luís. My biggest concern, however, are the lightsticks, which are found on big scale on the coast. 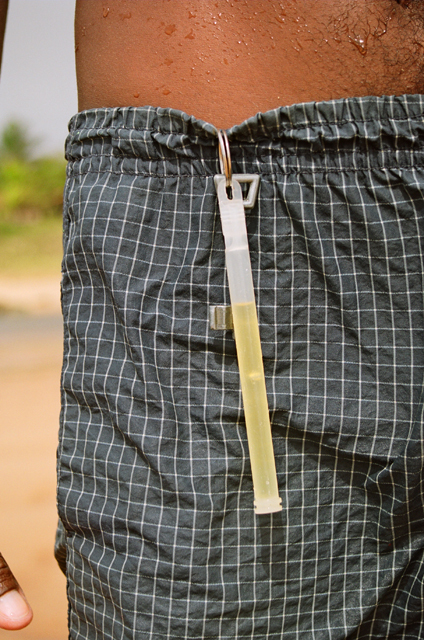 The problem is that our fishermen think that the liquid inside these objects is a remedy and use it indiscriminately. We know that this is toxic garbage, and we would like you to send us some specific informative material on these objects. We found here, in Morro de São Paulo, a lightstick and we would like to know what we should do in order to return it as soon as possible. Maranhão where I know that they occur frequently and to start informing the public about the problem in the region. público sobre o problema, na região. 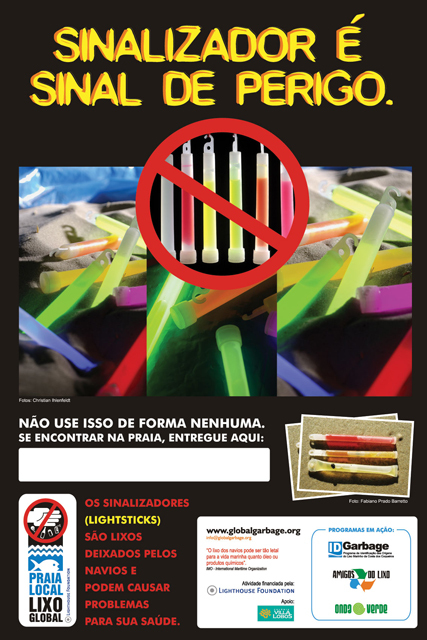 Fabiano, I know a person who lives in São Luis do Maranhão, to whom I sent the posters of global garbage about the lightsticks, and he told me that he found many of the sticks on the beaches there, close to Lençois. muitos bastões nas praias de lá, isso pros lados dos Lençois. We were impressed by the statement of a native person from an island who said that she travels to Salvador to massage an acquaintance using the lightsticks and that he, the “patient” said that his state has improved with this product, asking her to bring him more!!! Can you image that ??? Ficamos impressionados com o depoimento de uma nativa da Ilha que disse que viaja para Salvador para fazer massagem em um conhecido, utilizando os sinalizadores e que ele, o “paciente”, disse ter melhorado com o uso desse produto, inclusive pedindo que ele levasse mais !!! Imagine você ??? Yes, I have already found lightsticks on the beach (1 year ago ). They used to be more frequent. What worries me is that people without any information use the sticks and also the colorful liquid inside. One fisherman, a friend of my husband, put the oily liquid into the motor of his boat to “lubricate” it. 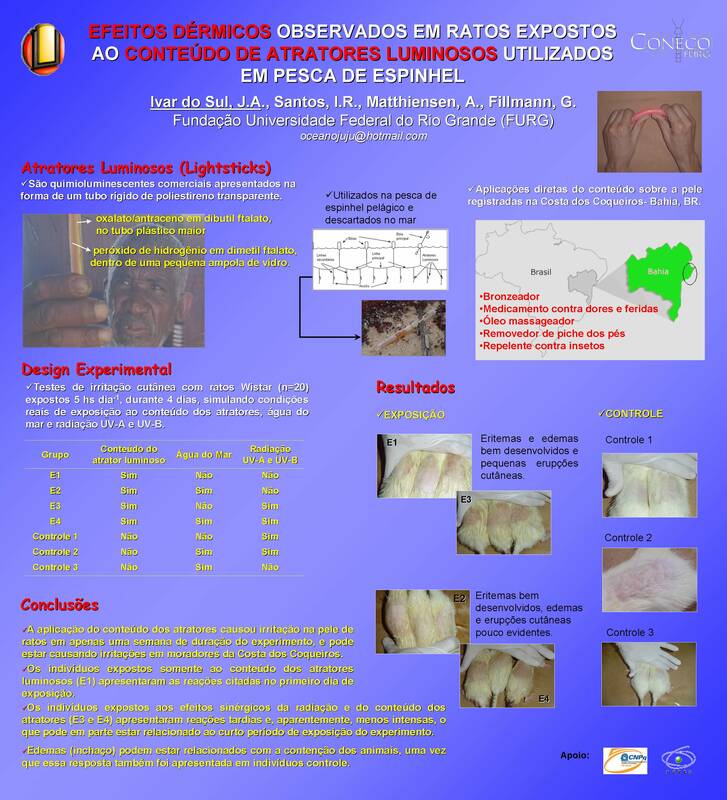 I would like to get some posters in order to disseminate them locally and also to collect everything that is found. Besides this type of garbage, a lot of other garbage is found, but most is left on the beaches by tourists that come on weekends. Já encontrei lightstik na praia sim antes (1ano atras ) eram mais frequentes, o que me preocupa eh que pessoas sem nenhuma informaçao usavam os vasilhames e tb o liquido colorido, um pescador amigo de meu marido quando viu a textura oleosa chegou a por no motor da lancha para “lubrificar”. gostaria de ter alguns cartazes para fazer a divulgaçao local e tb para recolher o que fosse encontrado, alem deste tipo de embalçagem muitas outras sao encontradas mas o maior numero ainda eh de lixo deixado pelos visitantes de fim de semana. Are Lightsticks the luminescent sticks, approximately 20 cm long and with a diameter of 5 cm?? Yes, we do find them sometimes … And the children play with them!! I read the article about the danger of cancer, terrible… If you have a picture, please send it to me. 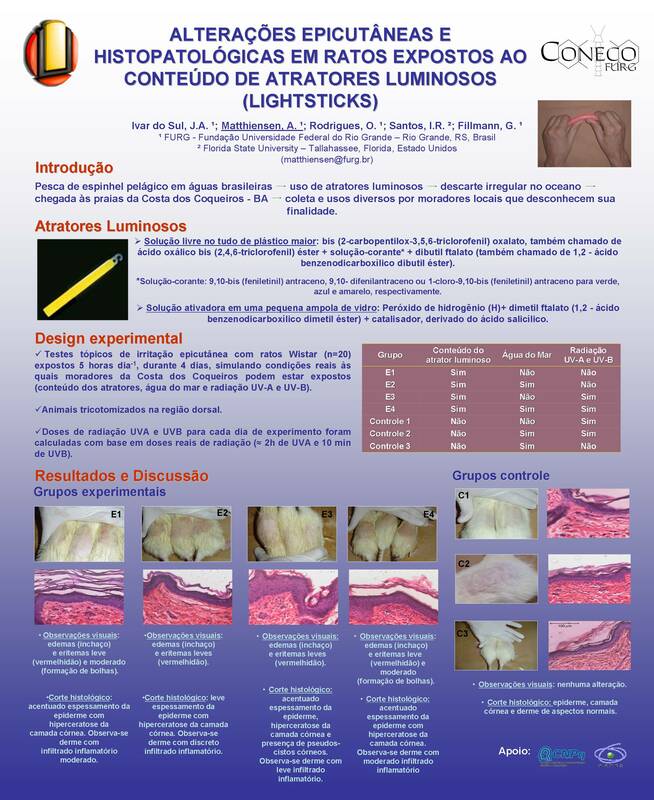 Lightsticks son unas barritas fluorescentes de unos 20 cm y 5 cm de diámetro?? a veces encontramos sí… y los niños juegan con ellas!! leí el artículo sobre el poder cancerígeno, un horror… si tenés alguna foto (liviana) x favor. We found some garbage this winter, however in small scale. We observed that, of our garbage here in the North Coast of Santa Catarina, most is left by beach-goes, tourists. Last week, we found some water bottles for shipwrecked on Praia do Balneário Barra do Sul. The name of the company was Viva Embalagens Ltda. Regarding the Lightsticks, we found a few, but we do find them once in a while. Encontramos alguns lixos nesse inverno, porém em pequena escala, como observamos o nosso lixo aqui no Litoral Norte de Santa Catarina fica na maior parte por conta dos banhistas, turistas. Na semana passada encontramos algumas embalagens de água para náufragos na Praia do Balneário Barra do Sul. Com o nome da empresa Viva Embalagens Ltda. Quanto aos Lightsticks encontramos poucos, mas sempre um ou outro é encontrado. (type sardine) coming from Germany. there are a lot of lightsticks and there you find the biggest quantity of garbage on the whole coast of Tibau do Sul. (tipo sardinha) vindos da alemanha. de todo litoral de Tibau do Sul. on the beach of Tamandaré, they have started to appear frequently, and also in Alagoas. We also discovered that people have used the content of lightsticks inappropriately. We also made a flyer with warning information to be distributed but, like you, we do not know anything about the toxicity of the content of these sticks. Just to add…Yes, lightsticks, and many ! We will make a “collection” of them…Few “gringo” garbage on the island…But on the other side, at Ponta do Garcês…. the stretch that goes until Valença…a lot. acrescentando…sim, lighsticks, muitos ! vamos fazer ‘coleção’ deles…embalagens ‘gringas’ poucas na ilha…mas do outro lado, na <Ponta do Garcês….aquele pedaço que vai até Valença…muito. I have been a marine biologist since 2001 and have been carrying out some environmental projects on the South Coast of Salvador, more specifically between the island of Tinharé and the peninsula of Maraú (Costa do Dendê). Although the projects that I coordinate are not linked to the question of litter, it is impressing to see the similarities of the comments that are made on the North Coast. 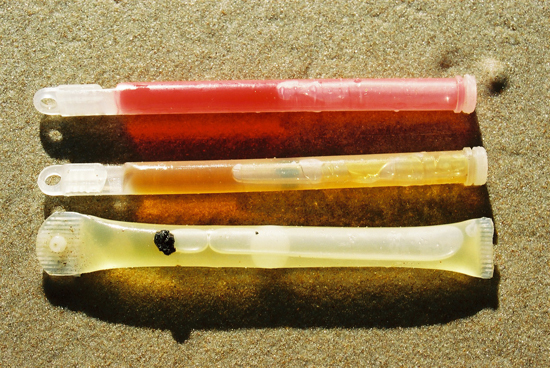 Several types of plastic (including many lightsticks) are observed along all beaches of Costa do Dendê, most of which are not yet urbanized and have still rudimentary tourism (Boipeba Island, for example). Sou biólogo marinho e, desde 2001, venho realizando alguns projetos ambientais no litoral ao sul de Salvador, mais especificamente entre a ilha de Tinharé e Península de Maraú (Costa do Dendê). Apesar de os projetos que coordeno não estarem vinculados à questão do lixo, é impressionante a semelhança que percebo com os comentários feitos pelos autores sobre a costa norte. Plásticos diversos (inclusive muitos sinalizadores) são observados ao longo de todas as praias da Costa do Dendê, sendo a maioria delas não urbanizadas e com o turismo ainda em crescimento (ilha de Boipeba, por exemplo). Fabiano, I have been talking to a friend of mine, Leonardo Daher, he is a professional diver and diving teacher, about the famous lightsticks. He told me that divers have not been using this type of equipment for almost 2 years. I asked him also who was still using it and he told me that many fishermen still use it, and even their own children open up the sticks because if you rub the content on your skin it becomes “shiny”. Fabiano, estive conversando com um amigo meu, Leonardo Daher, ele é mergulhador profissional e professor de mergulho, sobre os famosos lightsticks. Ele me disse que por parte dos mergulhadores esse equipamento não tem sido mais usado há quase 2 anos. Perguntei tbm quem mais usava isso, ele disse que muitos pescadores ainda o utilizam, e que até seus próprios filhos abrem as embalagem pois qdo vc passa o conteúdo na pele vc fica “brilhando”. Ilhéus, mostly on those at the north and in Serra Grande. I have not yet seen it around here, but I have seen a lot in Barra Grande and in Canavieiras. já vi muito em Barra Grande e em Canavieiras.